The substantial demand for oxygen generation in healthcare industry, environmental and chemical industrial processes is growing with the development of modern society. Low-cost oxygen production is of great importance in energy conservation and emission reduction. Because of the potential application in pure oxygen production with low cost compared to the traditional oxygen producing technology (cryogenic process), mixed ionic-electronic conducting (MIEC) oxygen-permeable membrane, a promising alternative for pure oxygen production, has attracted considerable attentions. However, the most challenging issue existing in these technologies before commercial application is to develop advanced materials with high performance operated at low temperature. Recently, Ph. D student Jiawei Zhu under the guidance of Prof. Jin et al. has published a new paper “Unprecedented Perovskite Oxyfluoride Membranes with High-Efficiency Oxygen Ion Transport Paths for Low-Temperature Oxygen Permeation” in Advanced Materials (DOI: 10.1002/adma.201505959, http://onlinelibrary.wiley.com/doi/10.1002/adma.201505959/full). 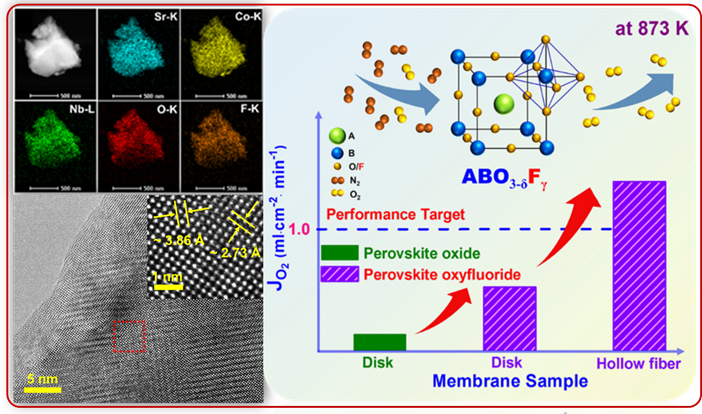 As a next generation of MIEC membranes, perovskite oxyfluoride membranes feature extraordinary performance for oxygen permeation, which greatly transcends the performance of state-of-the-art MIEC membranes and completely fulfils the commercial requirements at low temperature (< 923 K).